The School of Athens is one of the most famous paintings by the Italian Renaissance artist Raphael. It was painted between 1510 and 1511 as a part of Raphael's commission to decorate with frescoes the rooms now known as the Stanze di Raffaello, in the Apostolic Palace in the Vatican. The Stanza della Segnatura was the first of the rooms to be decorated, and The School of Athens the second painting to be finished there, after La Disputà, on the opposite wall. The picture has long been seen as Raphael's masterpiece and an embodiment of the High Renaissance. In the center of the fresco, at its architecture's central vanishing point, are the two undisputed main subjects: Plato on the left and Aristotle, his student, on the right. Both figures hold modern (of the time), bound copies of their books in their left hands, while gesturing with their right. Plato holds Timaeus, Aristotle his Nicomachean Ethics. Plato is depicted as old, grey, wise-looking, bare-foot. By contrast Aristotle, slightly ahead of him, is in mature manhood, handsome, well-shod and dressed, with gold, and the youth about them seem to look his way. 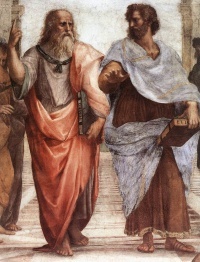 In addition, these two central figures point to different dimensions: Plato points vertically, upward along the picture-plane, into the beautiful vault and heaven above it; Aristotle's hand is level with earth, on the horizontal plane at right-angles to the picture-plane (hence in strong foreshortening), initiating a powerful flow of space toward viewers. It is popularly thought that their gestures indicate central aspects of their philosophies, Plato's his Theory of Forms, Aristotle's his empiricist views, with an emphasis on concrete particulars. However Plato's Timaeus was, even in the Renaissance, a very influential treatise on the cosmos, whereas Aristotle insisted that the purpose of ethics is "practical" rather than "theoretical" or "speculative": not knowledge for its own sake, as he considered cosmology to be. Unless indicated otherwise, the text in this article is either based on Wikipedia article "The School of Athens" or another language Wikipedia page thereof used under the terms of the GNU Free Documentation License; or on original research by Jahsonic and friends. See Art and Popular Culture's copyright notice. This page was last modified 10:32, 14 March 2011.